I hope you’ve all had an amazing weekend! I’ve been away on a family gathering and oh boi do I have an interesting and funny family, haha! I’ve finished a new book over the weekend and it’s not a personal favorite, but it gives me more perspective on WW2 and I haven’t read any stories that concerns Poland specifically so I learn a lot of new stuff while reading this! Andrew Borowiec is the son of an old wartime hero. Growing up as the son of a high ranked officer Andrew was early interested in warfare and everything that had to do with how wars functioned. As the 2nd World War draws closer things starts to change in young Andrew’s life and he is soon in the middle of a war where his proud country is merely a piece in the bigger puzzle. Andrew volunteer for the Polish Resistance in Warsaw and this is where he gets to experience the war up close and personal. This is Andrew’s story of his war and the period in his life that transformed him from child to a veteran soldier. Like I said, I’ve never read anything specifically related to Poland when it comes to World War 2. Of course it has been mentioned in several books due to its massive part in the Holocaust and as a frontier both in the beginning and the end of the war, but I’ve never read an account from one of the Polish cities while occupied. This story takes us to Maków, Cracow and Warsaw during one of the countries biggest trials. I learned a lot of prewar Polish history and also some national customs like Name Day. This is a tradition that in some places have been of greater importance than birthdays and it is normal to socialize with friends and family along with receiving gifts and flowers. I had to ask one of my Polish friends if they still did this and she said that they do. Some value it more than others. Back to the book; The prewar part of the book is based on Andrew’s childhood memories. This is reflected in how he has written this part which gives it quite some charm. Even though this part is based on memories from a young age you can still sense which part of the history we are entering, and small detalis often gives away what is going on in the world around Andrew. This is quite helpful, because, I for one, have a tendency to get so lost in the book and forget about the circumstances surrounding the book, especially when I read books like this. These small details helps you keep track of where you are in the history on a bigger level while you are reading Andrew’s story. I, personally, find this book a little too techincal at times. Some parts of the book I really struggle with because I don’t manage to connect to the story on a personal level. I think this is because I don’t always understand the terms that are used to explain weaponery, tactics and other important parts, greater perspetive parts, of the story. Although, I feel the book couldn’t have been written in a different way because it would loose so much of what makes it good. A person with a bit more knowledge of Warsaw and war weaponery would find the parts I struggle with much more interesting. The reason for why I have chosen to give this book 4 stars is because it gives a very good perspective on how the 63 Day Warsaw Uprising was and how it affected the ones participating in it. It also gives a clear and well written account of how it was to grow up during the prelude of World War 2. Another aspect is that it includes other historic episodes that took place during the period Andrew is in Warsaw. We hear about the 36th Waffen Grenadier Division of the SS, also known as the Dirlewanger Brigade, lead by Oskar Dirlewanger and their parttaking in the Warsaw Uprising. This brigade parttook in the massacre of around 100 000 civilians during the Uprising and was mainly composed of criminals with no issues of committing murder. Andrew’s account gives detalis collected from witnesses who survived the massacre and this puts Andrew’s story into the greater world perspective. 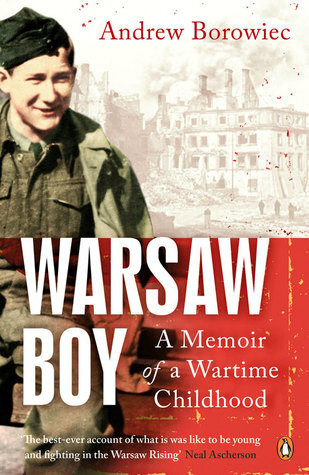 I would recommend to read this book if you want to learn more about the Warsaw Uprising, Poland during the war and how life was for a regular Polish boy who decided to join the Resistance at the age of 15.